Stonyfield Frozen Yogurt Pearls developed with WikiFoods. CAMBRIDGE — The strawberry- and coconut-covered frozen-yogurt bonbons in David Edwards’s new Kendall Square lab, WikiFoods, look familiar and tasty enough. But these bite-size treats, developed in conjunction with New Hampshire-based Stonyfield Farm, are not just another dessert. They are the first of a new wave of sustainable food products made to replace plastic packaging with natural, edible food skins. In this case, the outer layer is actually fruit. Its design is inspired by cellular structure, and it serves both as a thermal barrier and a protective membrane for what’s inside. 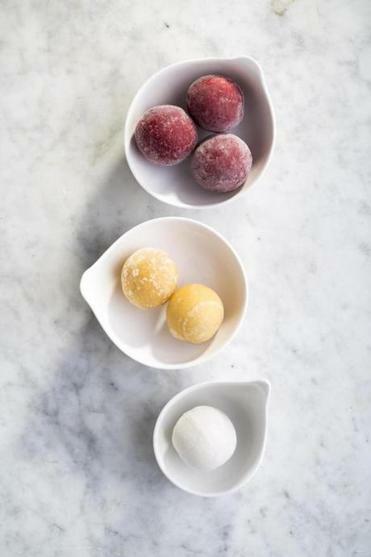 The size and shape of a donut hole or the Japanese dessert known as mochi, these Stonyfield Frozen Yogurt Pearls have a handmade look and a familiar frozen-yogurt tang. The exterior maintains its strength and holds the contents even as the centers begin to thaw, releasing little more than a bit of moisture. Stonyfield touts the product’s ability to be handled without damage. Edwards and his team at WikiFoods are seeking nothing less than to revolutionize the packaged food industry. 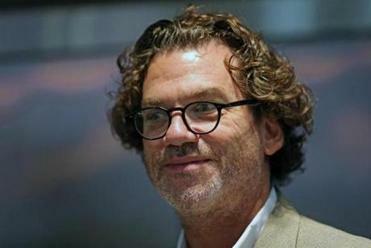 “There’s a trillion-dollar industry based on certain ways of eating, packaging, and distributing food,” says Edwards, a chemical engineer and a professor of the practice of idea translation at the Harvard School of Engineering and Applied Sciences. The “pearls,” as Stonyfield chairman Gary Hirshberg calls them, are the first innovation of WikiFoods to hit grocery stores. The product will be test-marketed later this month at various Whole Foods locations in the area. “Here, the notion is edible packaging — making packaging as nature makes fruit,” Edwards says. “Here, the notion is edible packaging — making packaging as nature makes fruit,” says David Edwards of the Stonyfield Frozen Yogurt Pearls. To engineer a protective, cell-like membrane for food packaging, Edwards had to create a material that would hold the product’s moisture in and keep oxygen out. The key turned out to be electrostatically charged food particles. By densely packing wikicells with edible material, such as the strawberries surrounding the frozen yogurt pearls, he is able to create a natural skin that is less permeable to moisture and oxygen. The edible skins can be made of many kinds of materials and become stronger as they are layered. Edwards envisions their use for foods ranging from yogurt to soup to beverages — all of which could be sold, like apples or tomatoes, without any other package. “It’s the first organic packaging ever,” says the entrepreneur, whose company, Advanced Inhalation Research, was purchased in 1999 by Alkermes Inc. In his quest to bring edible packaging to the supermarket, Edwards found a kindred spirit in Stonyfield’s Hirshberg, who has a long history of introducing organic products and corporate sustainability to the marketplace. “I’ve probably given 500 lectures where I have always said, ‘My dream is that when you finish eating the yogurt, you eat the cup,’ ” Hirshberg says. The pair met in Paris, where Edwards runs Le Laboratoire, described on its website as a “contemporary art and design center.” There, Edwards teams with scientists, chefs, and artists to create new and experimental food experiences. Also part of Le Laboratoire is WikiBar, a high-design ice cream parlor where Parisians can buy ice cream bonbons in flavors such as mango with a coconut skin, or chocolate with a hazelnut skin. Beyond ice cream, visitors have had the opportunity to experience, notebooks in hand, everything from cocktails to gazpacho to Black Forest cake, all reimagined as “wiki” eating experiences. The gazpacho, served frozen over vegetables, comes with a tomato outer layer. As it thaws, diners cut into the skin, releasing the cold soup. “It’s beautiful,” Edwards says. He has also experimented with herb-coated soft cheese and applesauce with a strawberry coating. Researchers at the Kendall Square lab are examining the physical properties of many potential foods for use as edible food skins. 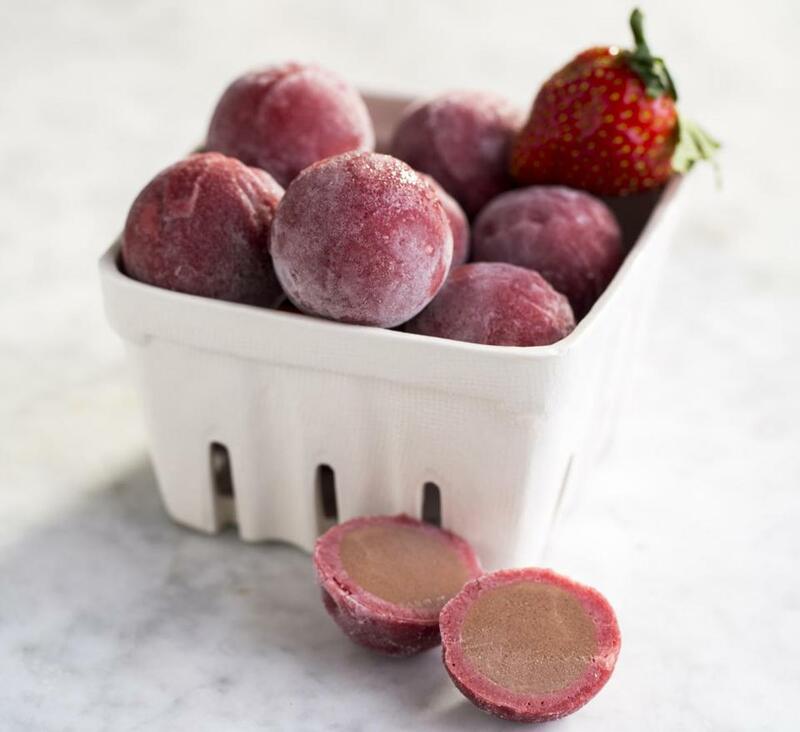 Stonyfield Frozen Yogurt Pearls developed with WikiFoods are wrapped in edible skins made from fruits. “It’s kind of a brilliant idea,” says Gus Rancatore, co-owner of Toscanini’s Ice Cream in Cambridge. He notes that ice cream has long been sold in a single kind of edible package — cones. Rancatore finds creative possibilities in a technology that could produce hand-held treats in a variety of forms from perfect spheres to geometric shapes. Stonyfield says it will be working with retailers on a variety of package-free formats from bulk sales to vending machines.